ENTERTAINMENT — Restaurant Collective & Beer Hall | Detroit Shipping Co.
Joe Jaber and The Last Divide are pleased to announce we will be performing at the Detroit Shipping Company on April 19th from 8 to 10pm. We are also excited to have the lovely Jennifer Westwood and Dylan Dunbar opening for us at this incredibly hip and awesome venue. DJ Ric Flair is taking over DSC this Friday! Join host Kaye Byrd and chat partner Tati Amare in a curated experience for women on the journey to living their best life. This session’s discussion topic is Friendship and the Power of the Female Bond. Do you have a Gayle King? Do you know how to cultivate a friendship? Do you value the friends you have? We're talking about the power of a female friend, the lack of, and how to keep a good one. You don't want to miss this great gathering of supportive women discussing an important topic. Doors open at 5:30 p.m.. There will be a limited selection of delicious bites, a fun activity and the chat begins at 6:00 p.m. Cocktails can be purchased. What are Girl Grow Chats: Real women having real conversations, about real life! Girl Grow Chats are moderated conversations and activities for women that cover topics of getting to know themselves, finding strength in being themselves and fully loving themselves. We also talk about what to do with all these good vibes on the journey to live our best life. Who should attend Girl Grow Chats? Women committed to self-discovery, self-care and who are on a crusade to improve their lives. Women who are willing to invest in themselves emotionally and be vulnerable in a way that breaks through figurative walls. Women tired of being stuck and ready to dive deep into topics and issues that tend to weigh us down. Women looking for a tribe as she navigates her journey. If you are reading this, you would benefit! What are the activities? In every Girl Grow Chat we participate in exercises focused on the topic discussed. They are always fun and high energy. We get a lot of 'aha' moments and do a lot of laughing. Should you be afraid to share? Absolutely not. The Girl Grow Chats are curated to be safe, non-judgmental spaces. Women who participate in these chats vibe good energy and want you to succeed just as much as they want to succeed. But it's up to you how much you share. I want you to feel comfortable. This show will feature photos of people riding BMX and just things seen while out riding. Come out for a fun night with friends! Karley Davidson is Metro-Detroit area artist and musician who plays the acoustic guitar and sing, using her BOSS RC- 300 loopstation to create unique versions of popular music. She was signed to All The Way Free Records in 2018, and has been working tirelessly to put out brand new original music. Best FREE comedy show in Detroit! Throw on your best acid wash denim, and come ROCK OUT WITH US! We’re going back to 80’s! Phil Simpson, owner of The Baltimore Gallery, is excited to join Detroit Shipping Company in an art exhibition. Featuring his iconic “Smile” art, this show will be a testament to the idea that smiles are contagious. Visit www.dixonsviolin.com, or on Facebook at www.facebook.com/dixonsviolin to learn more about this amazing artist! J-Rose and Phoenix join forces to create a new sound in the Detroit music scene combining beatboxing, vocals, effects and trumpet and wind powered synthesizers. Their sound is a futuristic, yet familiar one that will make you either want to dance or meditate, or maybe even both! Rocksteady Disco is back, bringing with them a lineup of DJs who are all ready to get the party started! Come out and show these out of towners a Detroit Time! Come sing your lungs out with Robby Rob, Metro Detroit’s premier karaoke service! Based out of Metro Detroit, Karaoke with Robby Rob is available for all occasions. Dan Tillery shares his heart and music with Detroit Shipping Company. You won't want to miss this intimate performance. 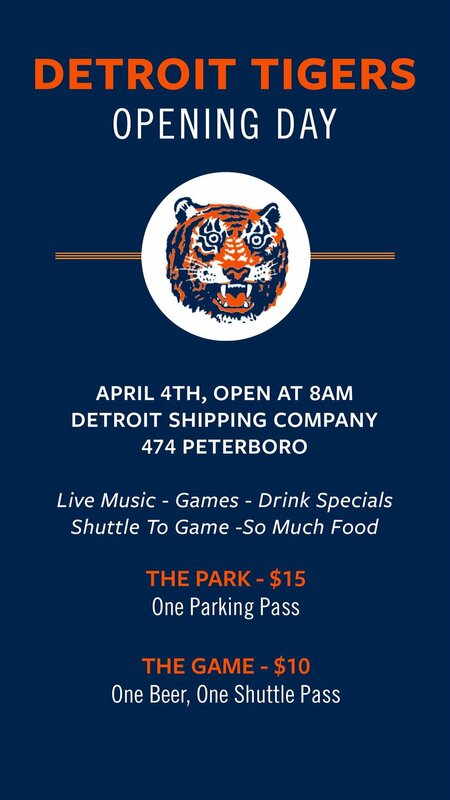 Parking passes and Shuttle passes to Comerica and Corktown available for purchase. Detroit-based artist, Joey Salamon, combines eye-catching patterns, a rainbow color palate and repeating geometric shapes to create his highly specific and unique style. Beyond private commissions, Salamon has created work for or in collaboration with the likes of Microsoft, Steelcase, Duo Security, Grand Valley State University, LBI Limited, Levitate Music Festival, the NORML Foundation, Fifth Estate Magazine and numerous musical acts such as Matisyahu, of Montreal, Lotus, Slightly Stoopid, The War on Drugs, The Orwells, The Disco Biscuits, Murder by Death, Guster, The Airborne Toxic Event, and has also been a frequent collaborator with the Bobcat Bonnie’s restaurant group in Detroit including the overall interior design, to name a few. Join us as we run the Devil out of Detroit with drink specials featuring Lagunitas! Let Nick Small serenade you with his dreamy cover songs and fresh, original music. Join us as we welcome Tyler Liepprandt of Michigan Sky Media to our Bridge Gallery. Join us for the WHATUPDOE WEDNESDAY’S Launch Party! !